Crystal Gerovac with Jade and Lily Opal, her two South Korean rescue dogs. 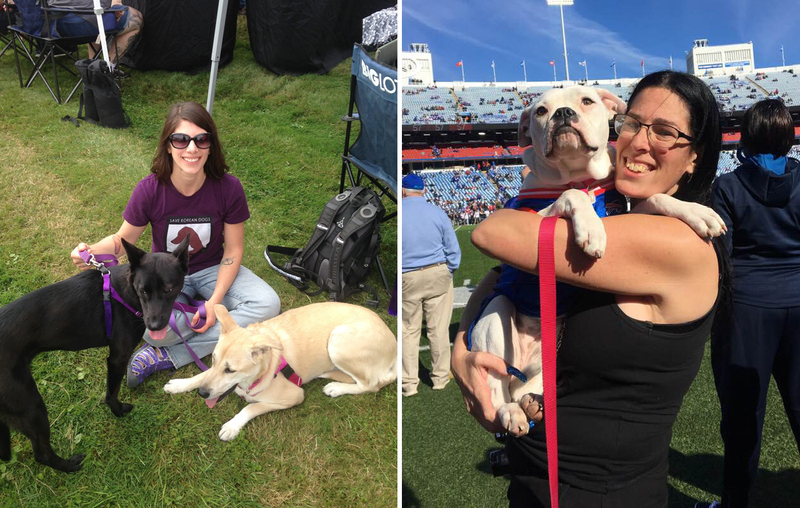 Skye Lipton, founder and president of The Silver Lining for Pitbulls, sponsors a weekly concession stand (in season) at New Era field to support their rescue work. When Skye Lipton, founder of The Silver Lining for Pitbulls, started her rescue group a decade ago, she never intended to become an advocate for international dog adoptions. Yet over the last three and a half years, she has helped find homes in WNY for more than 100 South Korean dogs rescued from the country’s meat market. Lipton says it all started with an ad she saw. Another local rescue group was looking for someone to take two dogs from South Korea. The ad piqued Lipton’s interest and prompted her to research the interesting journey that was bringing dogs all the way from South Korea to the United States. What she found was staggering—that, according to estimates, there are more than 15,000 meat farms in South Korea, accounting for close to 10 million dogs. There are no laws governing the treatment of animals on these farms, leaving the dogs to live in squalor, uncared for and often abused. While those numbers are huge and might have prompted someone else to look the other way, Lipton felt compelled to help, even if it meant finding loving homes for only a few. “That’s our motto,” said Lipton. After some initial research into the advocacy groups working on the ground in South Korea, Lipton and Ginger Pagnano, co-president of The Silver Lining, found themselves drawn to two dogs they were interested in adopting. One in particular really caught Pagnano’s attention. Jade was a nine-month-old Jindo mix breed who appeared severely traumatized. “As we looked through pictures, Ginger kept saying, ‘that’s the dog I want.’ We could see the fear in her eyes and we wanted to help her,” Lipton said. They contacted the rescue worker in South Korea, who was at first reluctant to send Jade to the United States, but eventually agreed. Jade and another dog, Naree, arrived in Toronto in 2015, and were placed in foster care with Pagnano until adoptions could be secured. Both dogs found homes within months of arriving here: Jade currently lives with a young woman in Buffalo near the Botanical Gardens who became so impassioned about saving dogs from South Korea that she adopted a second dog, Lily Opal, less than a year later. Naree also soon found a forever home. Those successful adoptions have since paved the way for almost a hundred others. While The Silver Lining for Pitbulls started out as a rescue group dedicated to saving pit bulls who had been abandoned and abused, often in the dog-fighting circuit, it has expanded to include a variety of breeds. Almost a quarter of the work they have done in the last three years has been facilitating the adoptions from South Korea; the rest of the time they are helping to raise awareness and find homes for dogs of all ages, types and sizes. “We started out very small—the goal in the beginning was 20 dogs a year. This past year we placed over 100 dogs. It’s about doing the best we can do, and doing the best for those we have taken in. We’re a foster-based group, so we need to make sure we have the space before we can agree to take a dog. Sadly, we have to say ‘no’ more than we can say ‘yes,’ but we’re thankful for every one we can save. We’re just a drop in the bucket and we know that, but the more people are aware and have their eyes and minds open, the better the world will be,” Lipton said. Behind the scenes Lipton and her group of volunteers work tirelessly to raise money to keep the rescue group going, usually after coming home from their full time day jobs. While the Korean dogs receive veterinarian care before they arrive—things like heartworm treatment and all necessary vaccines—there are still often vet bills once they arrive, depending on the needs and how long they are in foster care. And the flights from South Korea alone can often cost as much as $1,600. The Silver Lining does as many outreach events as possible. Lipton and her volunteers sell homemade craft products and promote adoptions, all as a way to raise awareness and funds. For the last two years they have also run a concession stand at New Era Field during home Bills games, helping to bring in further proceeds to cover the rescue group’s costs. Neither the advocates abroad, nor those involved locally, see this as peculiar in any way. It is simply passionate people finding creative ways to work toward a common goal: To get the dogs out of the abusive and neglectful situations they are often born into and placed into the forever homes with owners who will love and take care of them. Lipton says she will keep finding homes for dogs from Korea, as well as locally, as long as dogs need to be adopted. “I don’t love taking dogs from other countries because it’s not the way the world should be, but we are thankful for every life we’ve saved—either domestically or internationally,” she said. In addition to the South Korean dogs, hundreds of local families have also adopted Satos, a mixed-breed dog from Puerto Rico. The country has had a long-standing stray population with some estimates accounting for more than 200,000 stray dogs on the island. The epidemic was made worse by Hurricane Maria in 2017 when many people had to leave their pets behind. M.A.D. (Make a Difference for the Homeless Dogs of Puerto Rico) is one local organization, based in Albion, that has been facilitating the Puerto Rican adoptions. “We’ve been bringing dogs over from PR for five years, and have brought more than 450 Satos to date,” says Jennifer Stilwell, the organization’s president.